Panel – Brian Norton, Belva Smith, Josh Anderson, Wade Wingler | Q1 Connectin iPad wirelessly to Smartboard Q2 Public Access workstation accessibility Q3 Make Voiceover Louder Q4 Pebble Magnifier Options Q5 Eyetracking and Amazon Echo Q6 Text-to-Speech app for google docs Q7 Wildcard question. BRIAN NORTON: Hello and welcome to ATFAQ episode 16. My name is Brian Norton and I’m the host of ATFAQ. We are so happy you tuned in this week as we get ready to jump into questions you sent in over the past week or so. Before we do, let’s take a moment to go around and introduce the folks who are sitting in the studio with me. Belva, you want to say hey? BRIAN NORTON: Belva is our vision team lead here at Easter Seals Crossroads. I also have in the room Josh. BRIAN NORTON: Josh is the manager of our clinical assistance technology program at Crossroads. And also Wade Wingler. BRIAN NORTON: Wade is the popular host of the AT Update podcast and a VP here at Easter Seals crossroads. For those that are new listeners, I want to give you a little bit of information about our show. Throughout the weeks, we receive feedback and come across various assistive technology-related questions. We put those together and come up with a show. The entire show is us sitting around looking at the questions you have sent in and trying to provide our best answers to those. We also ask that as listeners you join in and help us better answer those questions by providing feedback. We love to hear from you. We have a variety of ways for you to reach out to us. We have a listener line at 317-721-7124. We also have an email address, tech@eastersealscrossroads.org. And also a twitter feed with the hashtag ATFAQ. We monitor that and look for those opportunities for you to ask questions but also answer the question yourself if you have some additional information that maybe we don’t cover in the show. Without further ado, the first thing we do in the show is look at feedback from this past week. We have a couple of instances of that. The first one is from David. SPEAKER: My name is David Ward. I’m an assistive technology instructor and Southwest Virginia where I work for new vision. I’m calling in response to one of the questions on ATFAQ, episode 58, where there was a question about placing phone calls from Amazon echo. My nonprofit and my class has been specifically focusing on a $20,000 grant where we have been buying Amazon echo’s for elderly individuals and those with vision loss in our community. I’m experienced with about 20 to 30 placements of those. I think the team accurately answered the scenarios of placing cause and the limitations of echo to echo. I would add an additional thought. I’m an AT&T wireless customer, and there are a handful of skills possible. You would have to look at your carrier and see if it has Alexa integration. Under my current plan, I can set up 10 phone numbers that I can designate and link to my AT&T account. Using my Amazon echo, I can place a text message and send it out. The limitations of that is you can’t – at least at the moment – reversed that and have the echo it read out a text message that you received. Of course that place is under the limitation on the person who asked the question who said they didn’t have a cellular phone line. That would be another issue. There are carriers that have things like that. Perhaps you could see if there is a skill for VoIP service, Voice over IP, or something like that. Just some future proofing, you did mention an iPad and Siri and things like that. Limitations that were mentioned about commanding it to call somebody and different things and not picking up as well, that of course is hardware limitation with the microphone. Later in the year there is supposed to be the HomePod released by Apple. That’s supposed to add some functionality. Additionally at Google I/O, the competing product, Google Home, which we also have in our classroom, does a really good job of picking up your voice just as good as the echo. They’ve announced – if I recall correctly – and integration that will allow you to place phone calls and, I would imagine, text messages. With both instances, I would imagine – and I imagine echo is going to try to compete in that space as well – I would imagine you are probably going to need a cellular connection or an android phone link to the Google Home or HomePod from Apple, I imagine an iPhone or some other connection. The only exception to that might be VoIP service. BRIAN NORTON: That’s great feedback. Thank you for giving us a call. Belva, you also had a couple of things to add about making phone calls. BELVA SMITH: We talked in the last show about the information had been released that the Google Home would allow us to place phone calls. The Verge has released an article that says that that is now available. Less than 30 minutes ago, I attempted to have the Google Home I have placed a call. It still tells me that service isn’t available in my area, try again in a few days. Hopefully any day soon it will be able to place calls to individuals that are in my Google contacts, and also a cell phone connected to the account isn’t going to be necessary because it is using the Wi-Fi. They did say something about using your Google plus phone number. If you don’t have one of those set up, your call will go as an unidentified caller. If you do, that number will show up as the person who is calling. I have not heard anything about it possibly being able to text so I don’t know if that’s going to be a possibility. BRIAN NORTON: Interesting technology. It’s great to see them integrate that type of functionality into those types of devices. BELVA SMITH: David had a good suggestion with this device that we are expecting from Apple. It could possibly be the one that will be the best at all of them. It’s going to need to do something because otherwise it’s coming into the market way too late. BRIAN NORTON: It’s one of those learning curves. They will have to catch up over time. I wanted to get to another piece of feedback. This is from Sherry. She was calling in response to a question we had about ago about alternatives to the KNFB reader. SPEAKER: Hi, my name is Sherry. This question or comment is for the Assistive Technology Frequently Asked Questions show. It is in response to one of your shows you had quite a while ago now. It’s about an app I think works just as well as the KNFB reader and is read. The name is Microsoft Seeing AI, as in artificial intelligence. The app has what they call different channels. One of the channels is a short text reader in which you just move – in this case I’m using an iPhone – camera over what you want it to read and it just reads it and is great for identifying mail that needs to be looked at further or thrown away, that type of thing. There is a document reader which works just like KNFB reader. There is also a product reader which read barcodes. There are two others, person and scene readers. Those both are still need a little work. They don’t work quite as well but are fun to play with. Again, that’s Seeing AI, made by Microsoft. BRIAN NORTON: That’s a great piece of information. I took a look at the website and it seems like it does a lot of good things. Belva, you mentioned earlier that you’ve heard some really good things about it as well. BELVA SMITH: Sherry, thank you for bringing it to our listeners attention. Just to add what she provided, the best part of Seeing AI is it’s free. In comparison to the KNFB reader app, in my opinion that makes it better because it’s not $100. Also Microsoft has a pretty significant team that is working very hard to make this product better and better. I need day, if not already, it is also going to have a money identifier available. It has an enormous number of barcodes already available to it. I say kudos to Microsoft because they have worked very hard to make this product good. BRIAN NORTON: It’s great when mainstream companies like Microsoft and these big players in the tech industry get involved in the world of assistive technology and start designing apps. Instead of buying an app, they actually design one from the ground up and make something that is super useful. BELVA SMITH: When they first started – I listened to a podcast about this just a week or so ago. When they first started developing this, they didn’t envision that it would be free. At the end of development as they were getting ready to get it out, they thought how are we going to get everyone to give us a try? They decided the best way would be to put it out for free. They were right because there are a lot of people using it. BRIAN NORTON: I may after the recording go grab my phone and get it downloaded to my iPad and phone as well. Is it iPad compatible or just on the phone? BELVA SMITH: I don’t know but I am assuming it would work on the iPad. JOSH ANDERSON: I would think so but I have only use it on my phone. I’m pretty sure you can use it on both. BELVA SMITH: A lot of times — like, the KNFB reader app says it will only work on the phone but I use it on the iPad. BRIAN NORTON: We are going to jump into questions. The first one was a voicemail from Pedro. We will read the question. Pedro has a daughter with low vision and is wondering how he can connect an iPad wirelessly to a smart board in the classroom. From our recollection, it’s wanting what is on the smart board to show up on the iPad, not putting the iPad on the smart board. I’ll open it up to folks in the room and see what you think. WADE WINGLER: One of the programs that does this, and I’ve used this for the other way, taking an iPad and projecting it on the screen, but I haven’t used it this way. There is a program called Reflector 2 from a company with a funny name, Air Squirrels. They have a product that allows you to push screens around in different ways. If you buy Reflector 2 for $15 for a single license, you can get free copies of Reflector Student. What that allows you to do is run the Reflector 2 on the smart board — assuming that the smart board is some sort of PC, Windows or Mac, and then you can push that content out to smart devices or computers or phones that students have in the classroom. The nice thing is Reflector 2 is $15 and the student version is free. According to my experience and research I’ve done on the website, it should work pretty well. The student can decide whether or not to share the screens and to what devices and it supposedly works on all kinds of devices whether they are laptops or chrome books or android tablets or iOS devices. The website is airsquirrels.com, and the products you want to look at are Reflector 2 and Reflector Student. BRIAN NORTON: When I first listened to the question, I was under the impression it was making the iPad show up on the smart board. But if you think about trying to make it go the other way – I’ve always said direct connect things when you can because it will be more reliable. I’m not really sure you can push out something from a PC to an android device with a direct connection. WADE WINGLER: I don’t think so. BRIAN NORTON: I think that might be our best answer to that. The Mac there is no way you can do it with a direct connection to the tablet. WADE WINGLER: There is no input for the tablet, only output. JOSH ANDERSON: With the person be able to use zoom and those features on their iPad if they were pushing that out? Or would it be a picture of the screen? I know I’ve run into that problem sometimes doing remote trainings and things like that. It is hard to use some of the assistive pieces. WADE WINGLER: Voiceover is definitely not going to work. A screen reader is definitely not going to work. I don’t know about using the built-in magnifier, whether or not that will work. BELVA SMITH: That’s two different things, the magnifier and the pinch and stretch. That’s what I thought he was wanting, for her to be able to zoom in and zoom out quickly. JOSH ANDERSON: Even being able to do that two-tap or three-tap and make everything larger. Maybe they’ll just have to play around with it a little bit to see which way works best. Hopefully one of those will work. BELVA SMITH: It’s not that expensive to give it a try. BRIAN NORTON: It’s not something we’ve messed around with here at our shop couple maybe there are some other listeners who have had some experience with that and want to provide feedback and let us know how it worked for you. We’d love to hear from you. A way you can let us know would be our email address, tech@eastersealscrossroads.org. You can also give us a call on our listener line at 317-721-7124. BRIAN NORTON: Our next question is one I get a lot. It has to do with what type of ideas or suggestions do you have for assistive technology components that should be considered for public access workstations. Specifically the question this past week was about a library system. They are interested in putting in some public access workstations for a library and what kind of suggestions when we have for that. Out just start out our conversation. That is something we’ve had some experience here at Easter Seals crossroads over the years. Probably for the past 10 or 15 years, we’ve been working with different partners, Work One offices, and library systems here in Indiana – our Work One offices here are the unemployed offices throughout the state – putting in some public access workstations for them. Before, I think what we had done is we looked at what the leading product is in a lot of areas from screen readers to voice input software to magnification software and look at what the leading product is, and we recommend that product. What I found over the years is the financial resources to sustain and maintain that equipment – this is usually one time money, so when you purchase something, there isn’t the opportunity six months later to do any updates. Technology gets old pretty quickly, get outdated pretty quickly. Then you are stuck with a mission that is not going to do what you thought it was going to do, at least for the long haul. What we’ve done here most recently in Indiana is started to look at using what’s on the machine. If you think about voice input software on Windows, it’s pretty good these days. It’s in the control panel under speech recognition. It also has the built-in magnifier, and some of the new versions of Windows there are some added features that make it more useful than it has been in the past. Again, looking at those built-in technologies as options for folks to let them know that — it’s not the greatest piece of software, but for public access, it’s good enough most of the time. And as you think about the future, a year or two down the road, those get updated with the operating system. If you’re updating the operating system on your other machines, you’ll be able to update the operating system on this machine, and those products are going to continue to get better. Like we were mentioning earlier, Microsoft and this new seeing AI, they are developing products that are within Windows as well and make those better. We started look at what is built into Windows, things like voice recognition and, screen magnifier. I still think JAWS is your option for screen reader. Maybe NVDA because it’s free, it’s good enough and does a pretty good job for folks. The other things I was thinking about work for folks who are hard of hearing and some other things. As far as computer access and public access, there is not much you would need to do. Maybe go down in the control panel and turn on things like sound century and things like that that gives you textbased warnings. Other thoughts on public access workstations for folks? JOSH ANDERSON: One thing is really important is the desk or area. You need something that will be adjustable and go up and down. Folks with different abilities will need to get underneath the workstation to be able to use it. BELVA SMITH: That’s where I was going. I totally agree with you, Brian. Save the money you would have five years ago spent on the software packages and invested that money into the seating and desk and maybe the headsets, microphones, that kind of thing. Absolutely, especially on the Windows, Microsoft are going to keep the adaptive software updated as they do the operating system. Your chairs and extra keyboards, mice, those are still going to be good a year or two from now. Maybe having an alternative method for the mouse, keyboard, that kind of stuff would be a better investment. BRIAN NORTON: Absolutely. The other thing I’ve talked to a lot when we do these public access workstations, these are regular computers. They run the same software that all your other computers do. I feel like there is a little bit of a stigma with these computers because they have the adaptive technology on them, and only people with disabilities should be using those machines. They end up never being used or being used rarely. I always encourage people in these places to say it’s just like every other computer. If you are out of other computers, have someone sit down here. It does the same thing. You can push those adaptive tools out of the way and put them on the back shelf or out of your immediate space. Just use the computer like you would any other computer as well and not leave it as a disability-only workspace if you will. WADE WINGLER: We’ve mostly focused on computer access. One other thing I find you get the most bang for your buck and a public library is a traditional desktop video magnifier. If you think about the people who come into the library, when I’m there, I see a lot of folks who are older where you have higher incidences of macular degeneration and those things. Don’t overlook the value of having a regular desktop video magnifier in the library. They are easy to maintain car train. I see people using those may be more than the abductive computer workstations. I just thought I would throw that in. BRIAN NORTON: I would say put it on a cart so they can be brought anywhere in the library. That’s an important piece. The things we end up doing with public access workstations, we actually spent time up front interviewing folks trying to figure out the people needs are that are attending that place. If you have a high volume of folks with macular degeneration or vision issues, let’s spend more of our money looking at vision equipment. Or if you have a large population of folks who are hard of hearing, maybe we need to beef up that area of technology. BELVA SMITH: I think it’s important to remember that no matter how much you do, you won’t be able to accommodate every single individual need. But you can certainly hit a large number. BRIAN NORTON: We always refer to it as the 20/80 rule: taking twenty percent of the technology out there to meet about eighty percent of the needs. There are folks that need some specialized types of equipment and you aren’t going to be able to address it in that public setting that well. WADE WINGLER: I guess a couple of things I would add is sometimes it’s helpful to think about the lower tech things like having quiet rooms that are indicated so that people know if they have somebody who is sensitive to sounds or lights, you have a smaller room you can control some of that. Or if you have a kiddo who might be having some unpleasant behaviors, making people on your staff know that here is where somebody can go to find someplace that is quiet and out-of-the-way. The other thing is to address those attitudinal barriers with library staff as well. You can maybe not have all the assistive technology, but if you have a really good library staff who are well informed and know what their resources are, that will go a long way as well. Education is always a big component of that. JOSH ANDERSON: You touched on a big part of that, which is training. Just training to know where these things are. Like Brian said, those built in things can be on any workstation. Some of it can help folks who don’t have – just having things a bit bigger makes things easier to read for any of us. Training is a big part of it. Brown that I’ll add to that, not just the clients that will use it but also training for staff. BRIAN NORTON: We started to also do videos. We do the print materials but always find that with turnover and things like that in these public settings, these paper manuals we create, they are there one day and gone the next. The past couple of times we’ve done these workstations as we have done a video training for folks. We put it on YouTube and they can reference back to that YouTube video whenever they want. For new staff that are coming in it, they have to sit down through the hour, hour and a half video talking about the technology cow what it is, how it works, and who it is useful for. I think that hits the public access workstations, what to think about, and some ideas. If any of our listeners want to chime in on this, we would love to hear from you guys. You can send us an email at tech@eastersealscrossroads.org. We would love to hear back from you. BRIAN NORTON: Our next question came internally. Belva had a question that came through: how can I make my voiceover on my phone louder? WADE WINGLER: This isn’t Brian from Columbus Ohio? BRIAN NORTON: This is Belva from Indianapolis. BELVA SMITH: I get this question a lot which is how can I make my iPhone be just a little bit louder with the ring, voiceover, and all that. Of course you can do a Bluetooth speaker, but that takes away some of your portability. One of the tricks I found is if you go into your settings and move all the way down to music, and then double tap the EQ, and go down and double tap “Late Night.” I would assume that late night would be quieter, but actually it’s a little bit louder. I do notice with mine turned on, it’s also a little crackly. While it may be louder, the sound to me was not as clear. That’s one of the tricks I’ve been sharing with my folks. It was actually one of my clients that told me that was what he was doing, and it really does sound different. BRIAN NORTON: What were the steps again? BELVA SMITH: You go to settings, which in my case is on my home screen. Scroll down to “Music,” which is close to the bottom. Scroll down to where it says “EQ.” Currently most people will have it turned off. Touch it once and that will open up your EQ sounds. Scroll down to the “Late Night,” and that turns on the late night. BRIAN NORTON: I didn’t even realize the iPhone had an equalizer. WADE WINGLER: Another low-tech solution I have found: have you ever taken your hand and cupped it around your iPhone to make it a little bit louder? BELVA SMITH: You can also drop it in a solo cup, and that will make it significantly louder. JOSH ANDERSON: I use that a lot. WADE WINGLER: There are some products – I haven’t used them and we can’t endorse them – some things called sound reflectors or sound vendors that you can buy off of Amazon for four dollars. They are plastic versions of your hand cupping around the edge of the phone. They clip over the edge of the phone and deflect the sound back to you. That might be something if you need more. JOSH ANDERSON: A lot of places have cute ones, an elephant and it somehow comes out the trunk. They are usually not very expensive. BELVA SMITH: When I’m in the car using GPS, I drop my phone down into the cup holder because that does kind of the same thing. WADE WINGLER: Word of warning: those cup should be empty, not full of your favorite beverage. BRIAN NORTON: Make sure the bottom of the cup holder itself doesn’t have something sticky in it. JOSH ANDERSON: Don’t do it in Brian’s car. BRIAN NORTON: When your McDonald’s cup leaks through and it leaves a brown stain in the bottom of your cup holder – not that I’ve ever seen that before. WADE WINGLER: Speaking from experience, Mr. Norton? JOSH ANDERSON: You have to leave those in a long time for them to start leaking. BRIAN NORTON: Dag-nab-it, my phone is stuck in my cup holder again! BRIAN NORTON: Our next question is from Lucy about the Amigo HD magnifier. She was interested in our perspectives about the pros and cons of the amigo or pebble lineup from enhanced division. One thing out there out before we start jumping into this question is we don’t endorse any products. We provide services. WADE WINGLER: I really like Jiff peanut butter. That when I feel pretty comfortable in endorsing. Today show is brought to you by – I wish. BRIAN NORTON: With enhanced division, you have a couple of different sizes of handheld magnifiers. You have the Amigo HD, a seven inch screen, comes with your stated magnification features like making things bigger, smaller. You can also take a still picture of something, a freeze-frame option. You can also change your color contrast. It’s a seven inch screen. One of the things Lucy had mentioned in her voicemail was that she didn’t want the big screen. JOSH ANDERSON: She’s looking for real portability. BRIAN NORTON: To have a couple of other options. The Pebble 4.3 inch is another. We have had some experience with the Pebble. It’s a little bit smaller. You’re not going to be able to see as much when you’re looking at stuff. It does come with a handle which is nice. If you are out and about and need to grab something or get in an awkward position to view something, having that handle is really useful. It comes with the same features, change contrast, change magnification, do a freeze-frame. I think there is an HDMI-out to be able to put it onto a bigger screen. I think the differences between the Amigo HD, the seven inch, it’s bigger, does not have a handle; and the Pebble HD is a bit smaller, 4.3 inch, and does have a handle and is useful. It depends on what you are wanting to use it for. They also have the pebble many. I don’t know about the pebble many. I haven’t had a lot of experience with that. BELVA SMITH: I am not a fan of the minis because you are using this because you have to make things bigger. With the smaller screens, you really can’t make things too big or your nesting enough. For example, you can’t magnify a phone number two times and see it. BELVA SMITH: You really need a very low level of magnification to be able to do anything with those smaller screens. I would suggest for Lucy to look for her local AT Act and find out what handheld magnifiers that they might have available that you can actually put her hands on and try out. One of the things I find as we do evaluations with these things, everybody has a preference on where the buttons are located and how tactile the buttons are or are not, how it feels in your hands, does it have a built-in stand so you can send it up so if you need to sign a check or something like that. Years ago, there was a handful of these things, and now there are literally so many of them anywhere from $300-$1300. It really important to try to get your hands on one and find out which one works best for you. Also, do you need it to do any kind of distance viewing? If so you’re not going to be able to do that with one that has a handle. There may be one that will do it. BELVA SMITH: I was thinking that you were looking at the amigo HD. I wanted to make sure you were also aware of the Zoom max seven inch, because it’s about $300 cheaper and pretty much does the same thing. They all pretty much do the same thing. You have contrast, freeze-frame, zoom in, zoom out, handle, no handle. BRIAN NORTON: I think you are right, Belva. Getting a hold of your AT act, laying out a bunch of different magnifiers in front of you and see how they look, how they feel, get them in your hands, figure out if it fits you very well. BELVA SMITH: And what kind of batteries it takes. It’s a batteries you can change yourself. I will warn you as you are shopping for these, some of the lower-cost ones do not include batteries you can change. That can be problematic if you have to send it back in to get the battery changed. BRIAN NORTON: It gets expensive. JOSH ANDERSON: Borrowing one and figuring out what works best for you is very important because none of them are inexpensive by any means. Something else you can also do, and it depends on what Lucy is looking for, iPad and those devices have built in magnifiers. For about the same price, you might be able to end up with something a little bit larger, lightweight, they can do other things besides modification. Having that built-in has changed a little bit and made it easier to use. I don’t remember how big an iPad mini is, about seven inches. WADE WINGLER: I use one all the time but I don’t measure it. JOSH ANDERSON: I know the regulars are 9.7 inch. I figure it’s about 7 inches. WADE WINGLER: It’s 7.9 according to Google. BELVA SMITH: I have a couple of folks that have a brother, sister, mother, somebody that has an older iPhone or smartphone that they are no longer using, so they are not paying any extra monthly service charge for it but are not using it as a phone. They are simply using it as a handheld magnifier. That’s easy to do, for free. Maybe you have a relative or friend that has an older phone they are not using anymore and would be willing to give it to you and let you use it because you can use the camera on it to take a picture and pinch and stretch to make it bigger. You can also put the magnifying app on it, change the colors, all that stuff. BRIAN NORTON: Put Seeing AI on it as we talked about. BRIAN NORTON: There are so many of these older devices these days. People always line up for the newest and greatest device. Someone needs to grab a hold of those older ones and look for that low vision community is a great opportunity to provide free assistance to them. That would be interesting to do. BELVA SMITH: With the Seeing AI app, in order to get it to do those wonderful things we were talking about like the barcodes, it will have to have a Wi-Fi connection. If you already have Wi-Fi in your home, all you have to do is put it on your Wi-Fi and you are good to go. BRIAN NORTON: If you have any other feedback about the different handheld magnifiers that are out there, don’t forget you can give us a call at 317-721-7124. We would love to hear from you. If you leave us a voicemail, if you’re wanting to, we can plug you in a let you be heard on the show itself. We look forward to hearing from you about that one. Our next question is something I came across on the Internet. There was a question out there that mentioned, I would love to learn more about how users are using their eye gaze devices combined with technologies like the Amazon echo or other technologies which can help save AAC user time and provide greater independence. A link with the question was also a video of a person using an PC-based augmentative communication system. It was textbased in a word document and it was allowing the computer to read out these phrases that would make Alexa respond. It was Alexa, tell me what time it is, and they would have it say that phrase and they were able to have Alexa tell them what time it was. It was a fascinating look at figuring out how folks who use eye gaze devices on the PC or with an augmentative communication device, how they might be able to use those devices to interact with these artificial personal assistant types of technologies in their home like Google Home, Amazon Echo, and those types of devices. The answer to the question if folks are interested in that was what they were doing is have a tech document drawn up and they were able to use their eye gaze system on the computer to be able to activate it and have it speak it. When it would speak, the Amazon echo would then respond with whatever information it might have. I would assume you can do that with the Google home and other devices as well. It was interesting how people were taking that personal assistant technology like Amazon echo and Google home and making it work for folks who have difficulty communicating themselves. JOSH ANDERSON: I’m sure you wouldn’t just use eye gaze. You can use any kind of augmentative communication device as long as you had the right keyword programmed in there. BELVA SMITH: I honestly had never thought about that. As you were sitting there talking about that, Brian — Josh, you and I recently shared a consumer that was using J Say. I remember how excited she was to get her Amazon device. She had a little bit of trouble getting it to understand her at times. We could’ve just typed up a document and had it do it for her. I didn’t even think about that. BRIAN NORTON: For those who are listening, what is J say? BELVA SMITH: J say is a screen reader while also being a speech recognition. Basically the two programs work together. The speech recognition knows when to listen and when not to basically. The screen reader knows when to read and when not to. It’s a pretty complicated system that’s getting easier and easier. WADE WINGLER: Technically it glues JAWS and Dragon together. It’s not a program on its own. It glues those two together so they work. BELVA SMITH: I call it marries. It marries the two together. BRIAN NORTON: It makes them play nicely in the sandbox together. JOSH ANDERSON: I call it a bridge between the two. We all have our own euphemisms. WADE WINGLER: These are great metaphors. BRIAN NORTON: It was interesting. What an interesting application for someone to take an augmentative communication device or some sort of computer application, whether using eye gaze or other text input option and using your computer to then speak out commands for a device like that. I thought it was an interesting application of that technology so I wanted to share it on the show today. BRIAN NORTON: If you have any feedback regarding that question or maybe you’ve had experience doing that very same thing where you have an interesting application for being able to use one of those personal assistants, whether that’s using the computer some of the way, let us know. You can give us a call on our listener line at 317-721-7124. Or send us an email at tech@eastersealscrossroads.org. We would love to hear from you. Our next question is from David. David was looking for a text-to-speech app that he can use with Google Docs or the chrome web browser. Any suggestions? JOSH ANDERSON: Read and write is what I use all the time. In fact, want to put it on the computer for about 30 days to get all the features, and if you don’t pay for it, you still get the text to speech features for free. I have started using it sometime for folks with low vision who have ZoomText magnifier but can’t see well enough to get the controls. It does a really good job on the chrome web browser. I haven’t used it as much on Google Docs but I would assume since they go through the same system, it should work about the same. BRIAN NORTON: Text Help Read and Write – Text Help is the company, Read and Write is the software. That’s an extension, I believe. If you go to the Google chrome store, you will be able to find all sorts of things. If you are looking for a variety of different options to be able to look for text-to-speech apps specifically for chrome and within chrome, if you go to the Google Chrome store, type in, “Text to speech,” I think a lot of options will pop up. JOSH ANDERSON: One of the Claro ones, I don’t remember the exact name, works really well. I’ve had good luck with Read and Write, because if you don’t need the highlighters and really cool features, you just need it to read for you, a pretty much does it for free. BELVA SMITH: That’s what I was thinking. BRIAN NORTON: I’m not that experience. I’ve not seen it be used before. Is a pretty good? BELVA SMITH: Yeah. I have used it. That’s what you use on the Chromebooks. JOSH ANDERSON: Is it only on the Chromebooks or is it an extension? BELVA SMITH: I’m pretty sure it is an extension. BRIAN NORTON: I have it as an extension in my Chrome but I don’t get into it too often. I’ve also got Read and Write and I like the options for it. I think Chromevox is more of a screen reading where everything gets read to you versus a more learning disability application like Read and Write might be. Snap and Read is another one that is out there made by John Johnston. Snap and Read is a pretty good program. I would encourage folks, if you are interested in text-to-speech for Google docs or chrome web browser, go to the Google Chrome store and check out the different options that are there. Most are free to download and you try them out and if you don’t want them you deactivate the extension itself. I’ve seen a lot of schools start to move to Google Chrome books. When they have Google Chrome books, for a lot of the AT stuff, they are starting to use these free extensions instead of paying for these really expensive programs to be able to put on a traditional PC. We are seeing a lot of development, much like with Seeing AI from Microsoft, these free extensions coming out do a pretty good job. BRIAN NORTON: Don’t forget, if you have any feedback about that, maybe you tried a different extension and have had good luck with that, give us a call. 317-721-7124. Our last question of the day is our wildcard question. That’s where I throw the mic to Wade and he asks us an off-the-wall question. WADE WINGLER: I hope I don’t drop the mic when you throw it. Slow and easy. I was going to ask a question about the eclipse because we are recording – I think most listeners know we record on one Monday and released the show on the next Monday. We interrupted our recording of the show together in the parking lot and look through some special lenses to see the eclipse. That’s not what I’m going to talk about because this will come out after the eclipse and people will have forgotten about it. Here’s what I was thinking. I just came back from a three day retreat where there were no clocks, no watches, no cell phones, no communication with the outside world, which was pretty glorious. From a Thursday night to a Sunday night, we didn’t have any connection with the outside world. For somebody who lives and breathes tech, but they did change for me and it was great. I realized in that process that I experienced technology fatigue. I’m back today and it’s like oh my gosh, all these buzzing, beeping things that are — ironically enough, Brian’s computer just beeped at us. Do you guys get tech fatigue? How do you combat it? Have you made life changes based on technology fatigue? Are there things you have changed or shut off or shut out? Talk to me about technology fatigue that you’ve experienced. BRIAN NORTON: For me, I don’t know if it’s technology fatigue. It’s just a work fatigue. Looking at the experience you just had, I love when I get away. Every summer we take a week long vacation. We go to a family camp in northern Iowa. There is no possible way to get reception unless you are in the lunch hall. Then you get a wireless connection. I love being away from it; however, I hate coming back to it. I think that’s where I get the fatigue. I make myself so available to folks every day, all day, that they kind of expected me to be back. When I got back, I’ve got so much stuff I have to dig through, voicemail, email, text messages, all these things that come through, website feedback. It takes me a long time. That’s where I get fatigued. I think everybody experiences that. When you go on vacation, the most difficult part of vacation is when you come back through the door at the unification to dig yourself back out. WADE WINGLER: I found my day being interrupted and kind of angry today because I just wanted to go out and look at the eclipse for a few minutes, but all these technology things kept happening. I couldn’t get an email to come up and answer a question, just a buzzing and beeping. JOSH ANDERSON: Along the same lines. It should be noted that Brian does return emails every time he finds that Wi-Fi in the lunchroom when he goes away on vacation. BRIAN NORTON: Only because I don’t want to come back to it when I come back. JOSH ANDERSON: One thing I do, whenever I am on vacation, I turn off all notifications, not just the noise but the number that pops up next to it. I disconnect not everyday but usually on the weekend. We had people over on Saturday. I did not look at my phone once, even though I felt it text a few times. I made sure it wasn’t an emergency, but other than that I didn’t look at it. Didn’t look at emails, anything. When I’m home, I don’t watch TV unless it’s game of thrones on Sunday night. That’s a whole seven hours a year. I rarely turn on the TV. Unless I do have work to get done when I get home, I do not want to look at a screen. That’s one of the reasons I had to get rid of Facebook and stuff like that. Even if people did put stuff on there, I didn’t see it until a week after it happened. It became almost more of a nuisance. As much as I can, I try to disconnect. I’ll answer the most and things like that, but I’ve learned what I ignore and it seems to cut down. WADE WINGLER: Josh, I admire you in a lot of ways because you come to meetings with paper and pen. You may have your laptop with you, but it’s in your backpack. I’m looking across the studio and your watch is made of wood. I think you do a pretty good job with that. BELVA SMITH: If you sent an email to my personal account, I might get back to you in about three or four weeks. I literally do not look at my personal email because I spent so much time every day doing work email that I just don’t have any desire to look at my personal email. Facebook is also something that I don’t bother with. I guess the fatigue for me is I have in my mind that email has to be work related. I don’t like just surfing the web like some people just sit and surf. That is not me. I’m going to Google. If I can’t find it really quickly, I’m giving up. I have to say, when I go on vacation, I don’t really miss the technology. Brian said he doesn’t look forward to coming back to it. I don’t really miss it. I’m not excited to come back to it because I know what it means. To me it means a work. I wish I could turn it off like you were saying, Josh. I wish I could just turn it off on the weekend and not pay any attention to it. Unfortunately because I’m always worried that it’s going to be something really important and I don’t want to let it get by me, I do always glance. I don’t usually respond. If you call me at 10 o’clock at night, I’m not calling you back. JOSH ANDERSON: She is not lying. She doesn’t. BELVA SMITH: But I will get up to see who’s calling me and try to figure out why. For me, I don’t do it personally like most people do. JOSH ANDERSON: Let me follow up on that. Do you ever get the fatigue where you swear you reply to things but you look through so many that you realize you really didn’t. WADE WINGLER: I did that with Brian today. Did you get this package? No. I’m looking back and that’s because I didn’t order it. The other thing I sometimes get, not so much anymore, are ghost vibrations. I’ve got this feeling where my phone buzzed that me about something and it didn’t. JOSH ANDERSON: And it’s sitting on the table or something, not even in your pocket. I get those from time to time. WADE WINGLER: Information provided on Assistive Technology Frequently Asked Questions does not constitute a product endorsement. Our comments are not intended as recommendations, nor is our show evaluative in nature. 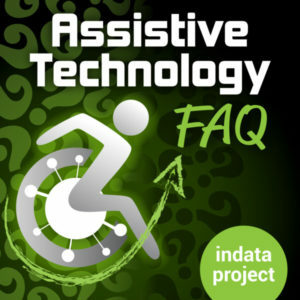 Assistive Technology FAQ is hosted by Brian Norton; gets editorial support from Mark Stewart and Belva Smith; is produced by me, Wade Wingler; and receives support from Easter Seals Crossroads and the INDATA project. ATFAQ is a proud member of the Accessibility Channel. Find more of our shows at www.accessibilitychannel.com.